10 Important things that you need to know about what’s in your crawlspace and a solution to fix the problems. We are all curious people; it is only human nature for us to be curious about the meaning of certain things or what’s hidden from us on a daily basis. Have you ever explored what’s in your crawlspace? Most of us have never even seen what’s down there. Most crawlspaces have nothing but dirt or stone and exposed ductwork and pipes, sometimes only having room to crawl and rarely giving you the ability to stand upright and walk with ease. Many homeowners forget about their crawlspaces entirely, which is a mistake and can become costly in the long run. Here are 10 things you may encounter in your crawlspace and what you should do about them. 1. Dirt: Like most homeowners, your crawlspace could be filled with bare dirt or dirt covered with rock. This is not good for the home because it allows moisture to permeate into this cavity and then transfer into the home above. This moisture can cause mold both in the crawlspace and eventually in the home above. Solution: To combat this problem, the first thing to do is have Integra-Clean & Dry install a vapor barrier immediately, to eliminate the moisture allowed to rise from the floor, into the crawlspace cavity. A more comprehensive solution would be a full encapsulation of the crawlspace, which would eliminate all of the moisture allowed into the crawlspace, from the walls and floors. 2. Ductwork: Commonly found in crawlspaces can sometimes overtime deteriorate and open holes and tears, which then causes moisture and condensation issues in the crawlspace. Solution: The ductwork must be inspected on a regular basis to make sure there are no openings in them, both to prevent condensation issues, as well to prevent insects and pest entry. 3. 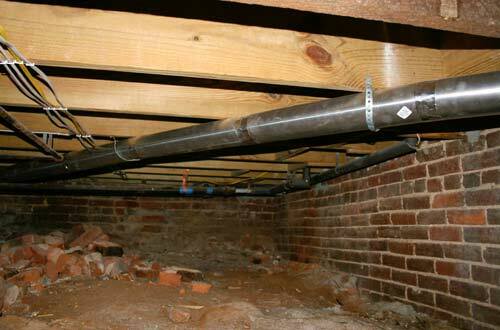 Plumbing Pipes: All plumbing pipes are routed through the crawlspace. They can leak, burst and freeze. Solution: Pipes should be inspected on a regular basis and the temperature should be maintained above freezing year round. 4. Electrical Wiring: Much of the electrical wiring of the home will travel through the crawlspace and it’s important to make sure that dampness and outside invaders are not able to get into the crawlspace to do damage to the wiring. Solution: Prevent moisture and water entry as well as opening into the crawlspace, which will prevent insects and rodents entry into the crawlspace as well. 5. Vents: Vents should be closed because they allow moisture into the crawlspace. Solution: Run a low temperature dehumidifier year round in the crawlspace. 6. Insulation: Insulation is one of the most important parts of your crawlspace. If you look into the crawlspace and see nothing but beams, wood and dirt, you’re in trouble. Up to 40% of your air comes up from the crawlspace. You can lose up to 45% of your home’s heating and cooling energy through non-insulated crawlspaces. They will grow mold and attract insects and rodents as well. Solution: Keeping your crawlspace properly insulated will save you money on energy bills and save you thousands in future damages. 7. Vapor Barrier: A vapor barrier is an important tool to maintain proper humidity levels in your crawlspace and home. Solution: A think plastic barrier needs to be installed over the dirt or rock, to form a barrier between the ground and the air cavity in the crawlspace. 8. Beams & Foundation Walls: These are the structure of the home and are crucial to the integrity of the home. Solution: Inspect the home on a regular basis to make sure the beams don’t have mold growth, cracks or other signs of decay. Check the foundation walls for cracks, bowing and other signs of damage or moisture entry. 9. Drains/Pumps: You may notice a drain in the floor or a pump in a corner. This is designed to carry water out should excess water enter into the crawlspace and cover the floor. These will pump the water out after the flood occurs. Solution: Have Integra-Clean & Dry install a waterproofing system in the crawlspace to prevent the crawlspace from flooding in the future. It’s not good for water to flood the crawlspace and bring the humidity level up repeatedly again and again. This flooding hazard should be eliminated permanently. Also, thereby helping to eliminate the possibility of mold growth. 10. Creepy crawlers: No one wants to go into the crawlspace and have to encounter insects and rodents. Unfortunately, many times that is what happens. Solution: If the solutions offered in the previous steps are taken, you will help to greatly reduce and maybe even eliminate the insect and rodent problem you previously had in your crawlspace. Insects and rodents are attracted to moisture first and they find their way in through openings. So if you eliminate themoisture, that’s step number 1 and if you close the vents and openings, that’s step number 2. You’ll be surprised what a difference that will make. The bottom line is, Integra-Clean & Dry are experts in the field of Crawlspace moisture control and we have years of experience to prove it. You don’t need to look any further for answers. Just give us a call and we’ll come out and find the solutions you need to have a healthy crawlspace and home for you and your future family!